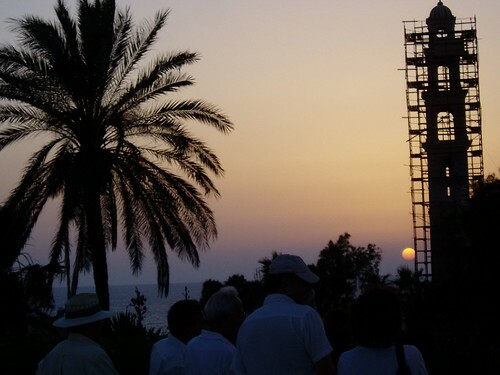 Jaffa is one of the oldest port cities and is steeped in history like most of Israel. 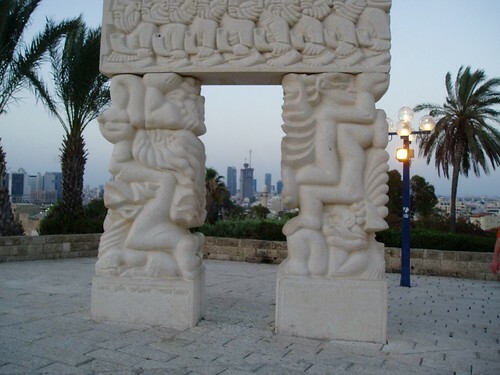 Jaffa finds mention in Bible as the port from where Jonah set sail to Tarshish. 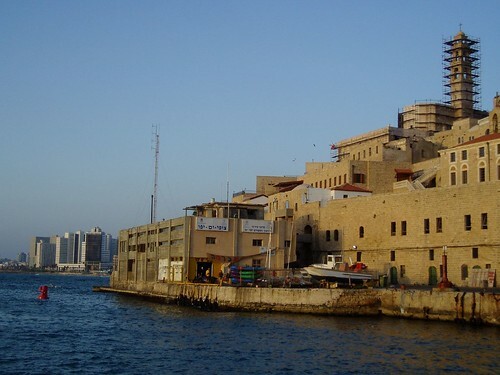 Jaffa is very close to Tel Aviv and was about just a couple of miles from our Hotel. We went there to look around and cap our trip with some good dinner..
A view of the Jaffa city with Tel Aviv sky line in the back ground.. According to New Testament, Simon Peter was in Jaffa to heal Tabitha. New Testament records that Simon Peter was in Jaffa to heal Tabitha the seamstress [Acts 9]. Standing on the roof at Simon the TannerÂs house he had a vision in which the Lord commanded him to eat foods that were "unclean" (not kosher) foods, [Acts 10: 9-16]. After three attempts to show unclean food to Peter, the Apostle understood that God was trying to get him to change his view of people as unclean (Acts 10:38) not to get him to eat the food. 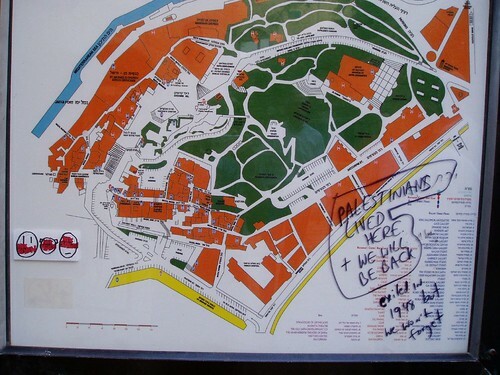 Found this Jaffa map with a graffiti with ominous Palestine message.. 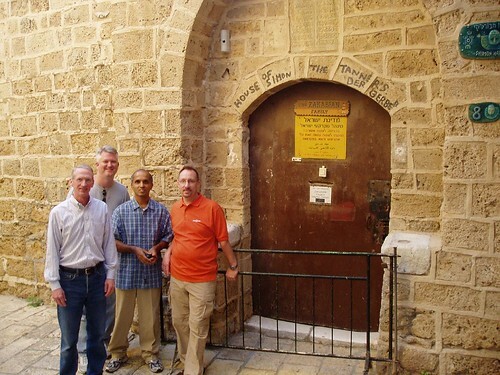 Some Israeli Arabs still live in Jaffa and there were some mosques as well. We heard the Muslim call for prayer from couple of places when we were there. Seems to be a popular spot for getting married.. saw several wedding couples.. Hanging Orange tree.. 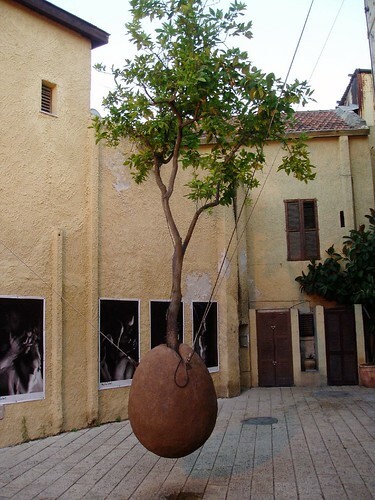 In old time, Jaffa had several Orange groves..Thiss lone orange tree is a reminder of that..
Mediterranean Sunset..Was a beautiful sight. We just sat there soaking in on the wonderful view. 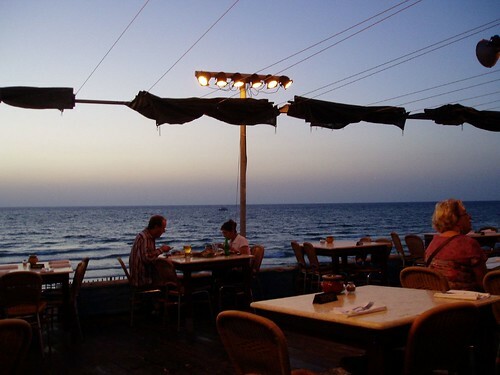 We capped our Jaffa city tour with dinner in this place. Don't remember the name of the Restaurant but was a good place. They didn't have much to offer for vegetarians but they went out of the way to find something for me. We decided to stay because of the gorgeous view. Your photos make me want to visit Israel. So looking forward to your next post. First time here. Nice photos and report about a less visited place (at least for Indians). Israeli backpackers are, it seems quite common in India. Israel has always intrigued me and glad was able to visit the wonderful country..
wonderful pictures ram. I loved that sunset photograph. Thanks.. Sunset by Mediterranean was beautiful.. I enjoyed it..
Why is the Palestinian message ominous? Weren't they kicked out of Jaffa... so they want to come back. I'm sure you would too, if you were kicked out of your city. Peace. Good Question.. Now the whole conflict in that part of the world revolves around who kicked out who first? right?